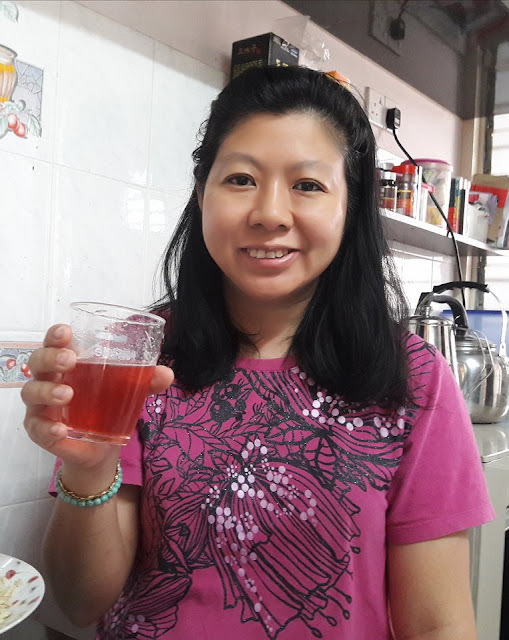 As a mom of two children without a maid, I lack sleep because I need to do household chores and take care of my children during the day and do my blog posts after my children sleep at night. I have dry eyes and dark eye circles which makes me look very tired. 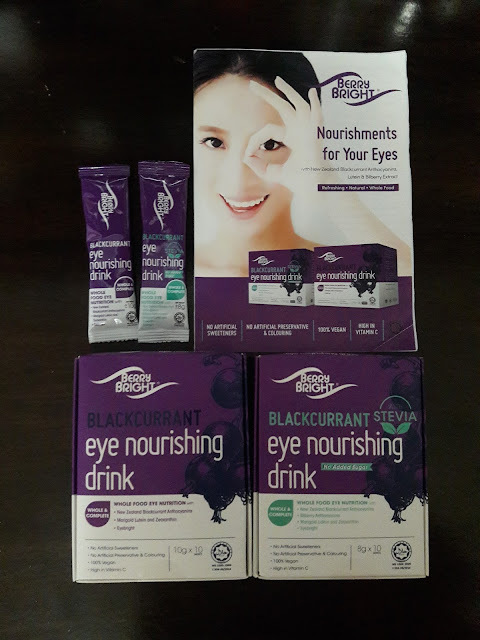 Recently I tried the Berry Bright Blackcurrant Eye Nourishing Drink which is a natural whole food eye supplement drink that is formulated to help to easily replenish the vital nutrients that are necessary to protect and maintain healthy eyes and vision. 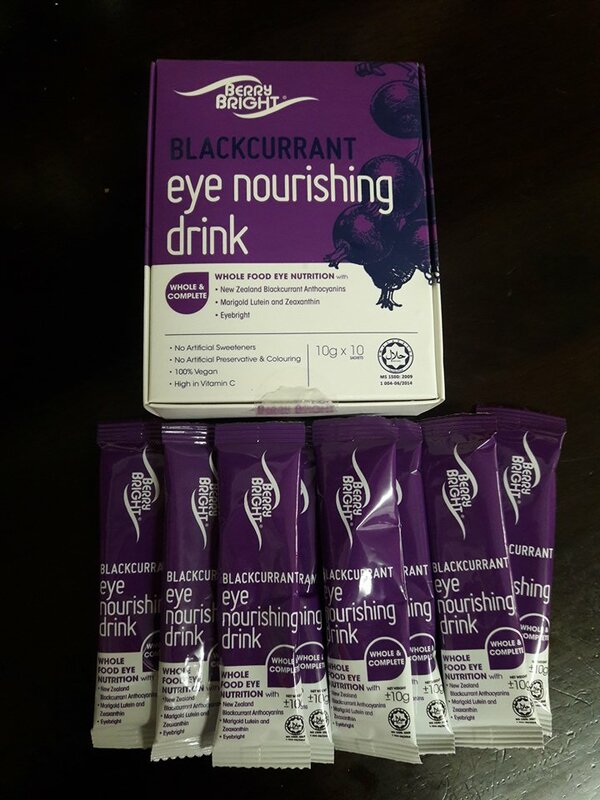 Berry Bright can improve vision health and is rich in antioxidants with New Zealand blackcurrant anthocyanins, lutein and bilberry extract. Berry Bright offers blue light filtering to protect the eye and improves blood circulation to eliminate toxins and reduce dark circles formation. 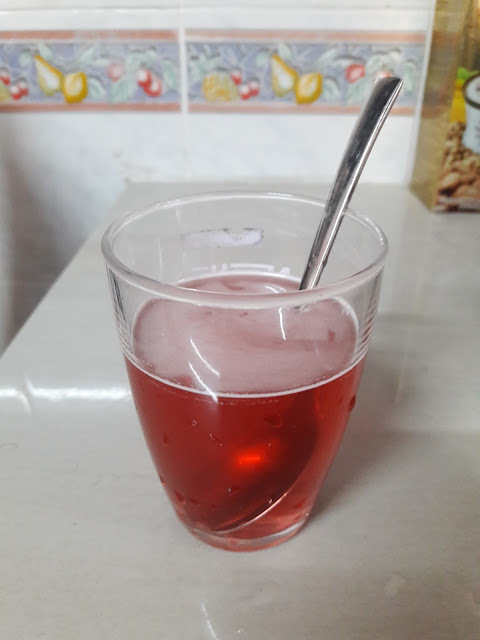 Berry Bright is recommended for contact lens users, heavy electronic device users, people with dry eyes, people who read long hours, prolonged exposure to sunlight, poor eyesight and poor night vision. Make sure you read until the end to find out how you can get 15% discount when you purchase your Berry Bright Eye Nourishing Drink. Berry Bright Original is suitable for anyone above 3 years old. My children have tried it too and they really love the sweet fruity taste. It contains fructose with 38 calories per serving. The Berry Bright Eye Nourishing Drink has no artificial sweeteners, no artificial preservatives & coloring, is high in vitamin C and suitable for vegans. It is also halal. Preparation is very easy. 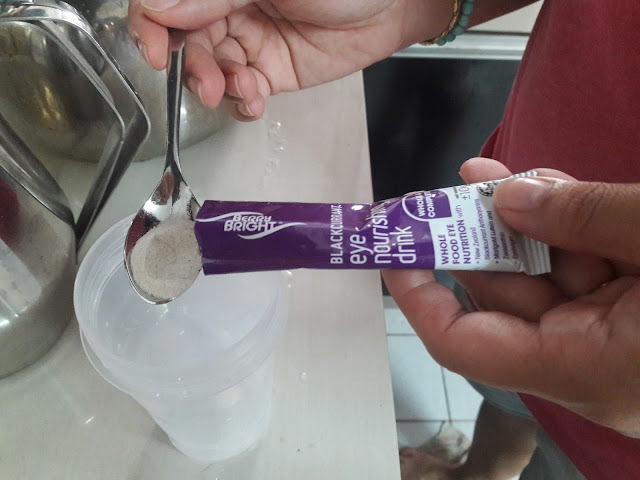 Just pour 1 sachet of Berry Bright which is in powder form into a cup and mix it with 150 ml room temperature or cold water. Drink immediately to avoid oxidation and drink this before meal. Berry Bright Stevia is suitable for diabetics or those looking to reduce sugar intake because there is no added sugar. It has enhanced formula with bilberry and mixed berries with 31 calories per serving. Put 1 sachet into a cup and mix it with 150 ml room temperature or cold water. 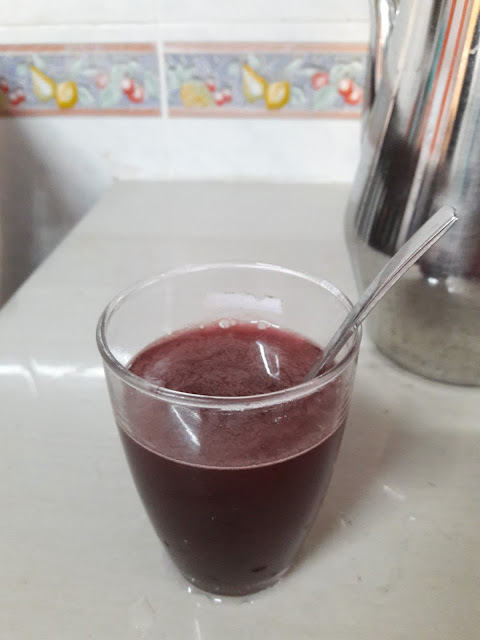 Berry Bright Stevia drink has a darker red color. It tasted very fruity and nice, less sweet compared to Berry Bright Original and very refreshing. 1. Malaysia Health & Wellness Brand Awards 2017, co-organised by Sinchew Daily and Life Magazines, endorsed by the Malaysia Ministry of Health. My whole family really loves Berry Bright Eye Nourishing Drink since it can protect & maintain healthy eye vision and it taste very good. I have great news for all my readers because you can get yours with a 15% discount if you use my code lindayeedc01 when you order yours online HERE. For more information, you can check their FACEBOOK or INSTAGRAM. I have heard but good things in this product. We need to taking care of our eyes too. 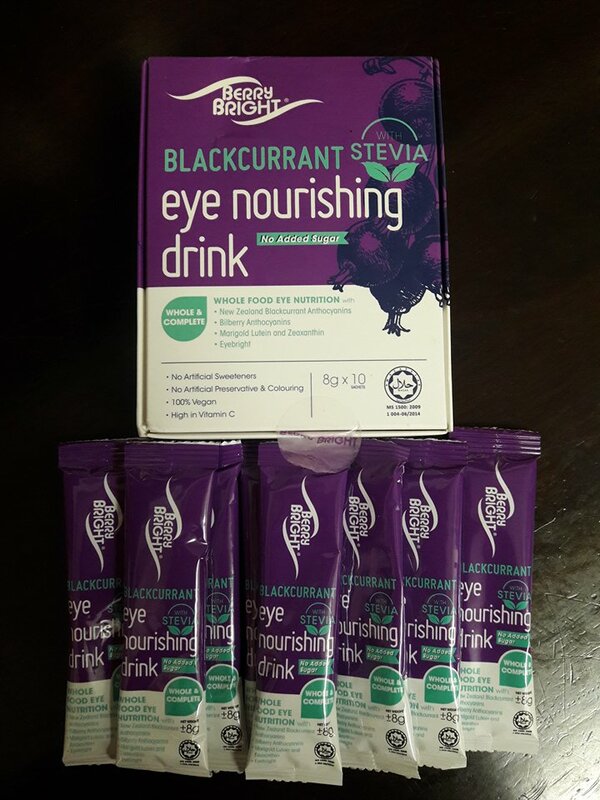 and this eye nourishing drink looks really good. Will definitely check this out. Yes, it's good to take care of our eyes. Remember to use my code for 15% discount. 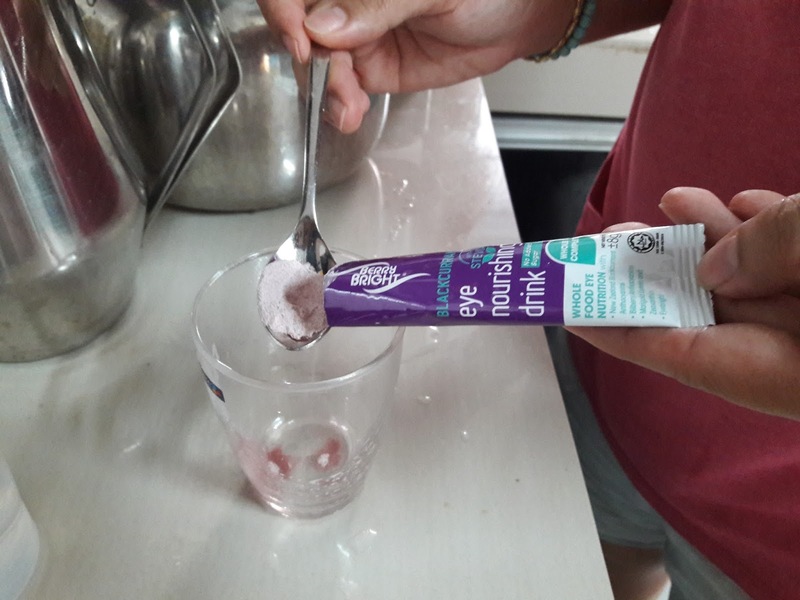 Healthy drinks for my eyes! Im in! I need this since am already with reading glasses. I also need this healthy and delicious drink for eyes. Recommend to friends. Remember to use my code for discount. Thanks. Give it a try. Should be good for your eyes. Yea i got this for myself as well. Im already loving it. Would love to share it with my family member. This is really one good product ya. I wanna try for my eyesight too. Do try it out. Really good for your eyes. Glad that it helped. Remember to use my code : lindayeedc01 for 15% discount.